Currently the fifth largest global economy and second largest European market with a population of 65 million, France is a major economic country. It ranks first place in Europe for aerospace and nuclear industries, second place for chemicals and agribusiness and third place for the ICT and pharmaceutical sectors. Of the top 500 largest Companies in the world, 31 are French (Germany has 29 and United Kingdom 26). France is also a great maritime nation. Present in all oceans through its overseas territories, it is the second exclusive economic zone in the world (11 million km2). The metropole has 40 commercial sea ports. Port-La Nouvelle is the 14th biggest national port and the 3rd French Mediterranean port. Note to foreign investors: within Europe, France is the first country to welcome foreign investment in the industrial sector. In total, there are more than 20,000 foreign-owned firms operating in the country, out of which 32% are Companies with over 5000 employees. They employ 1.8 million people (13% of the employed population) and participate to one-third of French exports. Occitanie is one of 13 regions of France. It enjoys an exceptional location in the heart of Western Mediterranean Europe with access to over 260 million consumers. Occitanie is the 5th most populated region of France (5.8 million inhabitants). The territory covers 72,724 square kilometers, more than Ireland area (70 273 km²) or Belgium (30 528 km²). It consists of 13 departments. The regional GDP (150.4 billion EUR) is the 5th rank nationally. Investors will find plenty of available land resources in an exceptional weather environment (over 300 days of sunshine per year). More than 600 hectares within 1 hour of Port-La Nouvelle are already zoned for development ready to welcome new industries. Some may be linked to the port area by rail. Transport infrastructures include 4 motorways, 3 maritime and 1 river ports, 10 airports, 2,900 km of railways, several intermodal platforms and the Canal from River Rhône to Sète. The Occitanie has an international presence through 4 representative offices (Shanghai, London, Casablanca and New York). All investor will be certain of receiving efficient personal assistance and support from the Chamber of Commerce of Aude and from Invest Sud de France, the regional office of INVEST IN France network, during the investment process. The economy of the department is mainly based on the tertiary sector (63.6% of firms). Agribusiness and tourism are the dominant industrial activities. Located conveniently between the dynamic influences of the cities of Toulouse and Montpellier, the General Council has developed tools to stimulate the economic activity of the Department like, for example, the development of land resources. The expansion of Port-La Nouvelle is an integral part of its development and investment programme. Grand Narbonne is an intercommunity Council founded in 2003 primarily focusing on boosting economy and innovation within its boundaries, including the maritime coastal economy, while preserving and enhancing the natural areas. The development of Port-La Nouvelle is one of the cornerstones of its policy of growth and job creation and the promotion of industrial activities. The first community in the department of Aude, Greater Narbonne has a population of more than 120,000 people and currently has over 14,500 companies. The population increases has increased by 2,000 inhabitants per year for the last 10 years, one of the highest growth rates in France. Greater Narbonne has consequently become an attractive area for business, especially as it offers plentiful training and innovation research centres. In this context, the future port is a catalyst for projects and Port-La Nouvelle’s expansion fully complements the council’s strategy. With 6,000 inhabitants during the year and 30,000 tourists in the summer season, Port-La Nouvelle is a municipality with a strong ability to adapt. Only 420 hectares (11.5%) are urbanized, giving the city an environmental dimension. Port-La Nouvelle has a comprehensive set of shops and services. 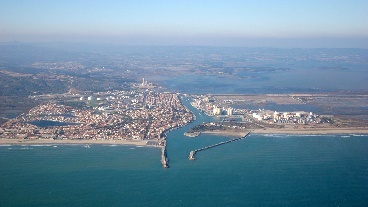 Since its origins, the town offers two faces : a southern part occupied by Urban Habitat and a northern part dedicated to the industry and port traffic. The port area is also adjacent to the Regional Natural Reserve of Sainte Lucie (825 ha). The two entities are not turning back, having different issues but similar goals of sustainable development.